TRY FISHERY REPORTS AT YOUR FISHERY TODAY! Ideal for game, coarse and sea fishing. Ideal for all day/season ticket lakes and rivers, Salmon River beats, fishing hotels and holidays, booking agents, competition organisers, fishing clubs, fishing lodges and fishing travel companies. 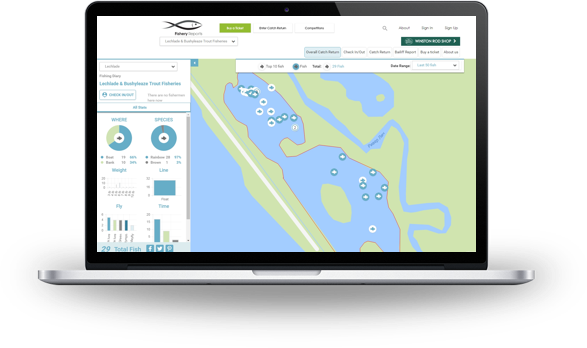 For fishery owners, the Fishery Reports application provides a booking and sales module, stock management module, detailed catch and stock reports by size, species and angler, visual catch returns, sophisticated and targeted marketing campaigns and a host of management reports. And for the anglers? In addition to modern, 2016 levels of customer service, Fishery Reports provides anglers with an unrivalled level of information that is vastly superior to current standards. Visual and interactive catch returns provide anglers with a graphic version of the old catch returns book. Giving anglers access to accurate, up-to-date information about the water they plan to fish will improve their odds dramatically that they will have an enjoyable, successful and memorable day’s fishing. Fishery Reports is modular, so you can pick and choose features which suit you.